This past Friday, 24 October, Kate Wimpress and Valla Moodie welcome us to North Edinburgh Arts in Muirhouse. North Edinburgh Arts functions as a community centre, art gallery, project space, café and the home to a growing project for local residents. Kate began the afternoon’s discussion highlighting the key elements that are integral to the North Edinburgh Arts organisation, addressing the on-going regeneration of the local area and both the challenges and rewards of running the centre in such an unexpected area for an arts hub. 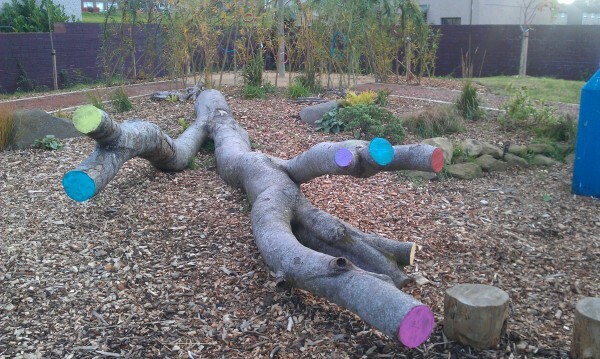 The centre’s garden, known as the North Edinburgh Grows project, truly has redefined the function of the entire organisation, emerging as a driving force of participation, engagement and sustainability. 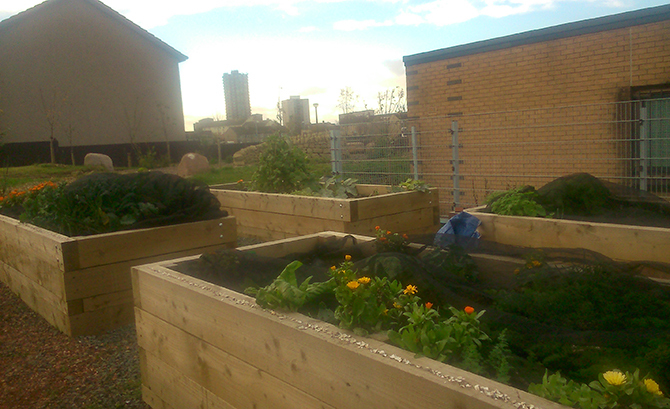 Over one third of the garden property has been devolved to other local groups, making both the garden space and the existence of North Edinburgh Arts inherently self-sustaining. Designed with support from ANTA Architects, the North Edinburgh Grows project includes play space, gardening plots, quiet spots for reading and a labyrinth path. 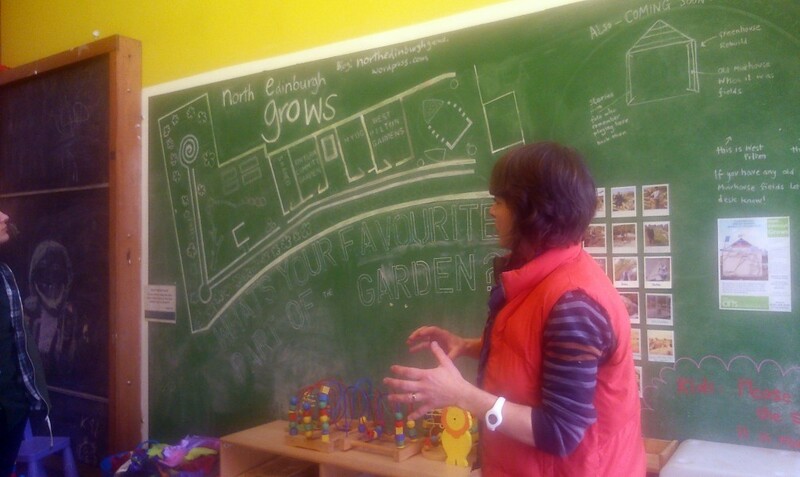 Current artist-in-residence, Natalie Taylor, joined us for the afternoon’s gathering and explained her role in shaping the garden, both through whimsical visual interventions and by encouraging local involvement. The garden is a place where local children and fresh produce thrive; Natalie is able to encourage the positive regeneration of this space through her artistic and social practice. 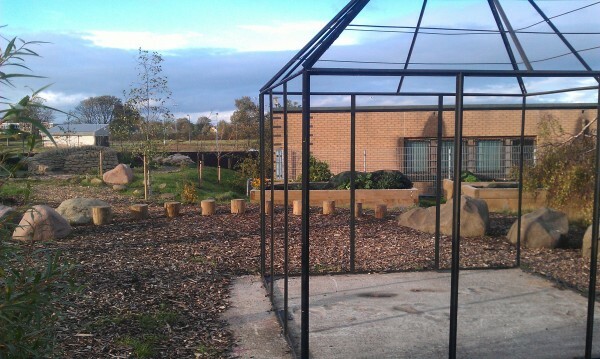 The garden opened in May 2014, offering local children and other community groups the chance to learn how to grow food, engendering themes of self-reliance and responsibility. We had the privilege of being led on a garden tour by three eager local children, and it was clear that the garden is a space that entirely nurtures their imagination. After lending a hand to one of Natalie’s smaller painting projects in the garden, we wrapped up the session with a discussion about the wider role of the arts in urban development. We also explored the availability of spaces for the arts within Edinburgh (prompted by the fact that for many attending it was their first visit to North Edinburgh Arts), and how artists and communities can benefit from socially-driven, and economically accessible creative opportunities. The North Edinburgh Grows project is a prime example of how collaboration can give on-going life and energy into a project. Though Kate admits that the organisation will always need management and structure (as well as funding), by injecting energy into a once-overlooked space immediately surrounding the facilities, the organisation will see a flourishing of activity in the years to come. And with the project being shortlisted for a 2014 SURF award, it is clear that the project is gaining well-deserved praise from the Scottish design community. North Edinburgh Arts provides opportunities for individual and community development through contact with the professional arts, particularly for residents of Greater Pilton in Edinburgh. To find out more about their work, click here.